Many improvisers have trouble transitioning from playing exercises to actually making music with the elements they are practicing. The Randomization process gives you the steps to do exactly that, smoothly and effectively. In this post I share with you a concept that can help you open new improvisation possibilities in your soloing. 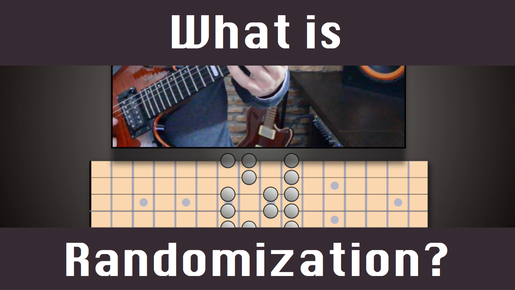 It’s a concept called Randomization, and it’s an essential part of the LINEAR FREEDOM Improvisation method. Although it's actually very simple, I have seen it literally transform the playing of many of my guitar students. You see, when you practice a musical structure, like for example a scale, or an arpeggio, you tend to just play it up and down play, which is very useful to do, because that’s how these structures are usually used in music, mostly moving up or down in a linear fashion. Of course It can be very cool to sometimes mix the notes around and create a more eccentric sound. That is what we call angular playing, as opposed to linear, but that’s usually a special effect, or reserved for certain styles. The bulk of our musical vocabulary consists of more linear melodies. But that doesn’t mean that these lines need to be boring. This is where randomization comes in. It’s the process with which we teach our mind to change directions unpredictably when playing melodies, so that they don’t sound like exercises any more. Combine that with sprinkling in a few interval skips, and with some practice, you can reach a point where you can generate countless original and interesting melodies, without depending on memorization and learning licks. Of course learning licks can also be very interesting and useful if done intelligently, but that’s another story. We go deep with this concept in my Linear Freedom Improvisation course, where we first build a solid foundation of muscle memory in both hands before getting into this, but randomization can give you results even if you just start practicing it in it’s simplest form, which is what I show you in this video. The clip is from lesson 6 of Linear Freedom, where I explain the main concept and then demonstrate over a backing track. You can then apply this to any scale you want.